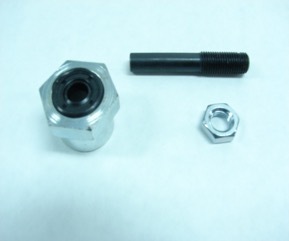 Simply replace clutch hub nut and adjuster screw "Figure # 2" with updated version "shown top picture"
Note: You must install new dual O-Ring adjuster screw from the backside of pressure plates so as not to damage O-Rings. O-Rings now seal mainshaft internally from oil transfer into clutch. Lubricate O-Rings with O-Ring lube or transmission oil from transmission. * NOTE: The use of a Red Thread Locker is required on all BDL transmission clutch hub nuts. 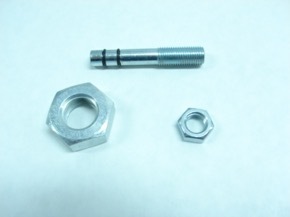 New Hub Nut Part # EVHN-500 are left hand thread, Torque to 70 -80 Ft. LBS.